At Gingerbread Learning Center, each programs top priority is providing a safe environment for the children to learn and grow. All of our teachers are certified in First Aid, CPR, and early childhood education. During this period of time, children are learning an array of new skills. Our teachers create lesson plans with fun yet challenging activities that encourage children to explore these new skills. Below is more information on what each of these programs has to offer. For information on tuition click here. If you have not already, schedule a tour! We start enrolling infants at 6 weeks old. Our teachers work closely with the parents to create a schedule that matches each infants individual needs. At this stage of development, children are exploring a variety of new skills. Our teachers engage with songs, books, games, and play, that encourage growth in social, language, cognitive and motor skills. We also provide formula, and snacks and no additional cost! As children begin walking and talking, they start to explore their independence. We provide plenty of room in a safe space, for the toddlers to push their curiosity. Our Program follows a routine, while challenging the children to complete tasks on their own. We want every child to feel a sense of accomplishment, and success at our school. Your toddler will enjoy activities focused on language, movement, senses, and relationships including treasure hunts during pirate week! Preschoolers are gaining more confidence in their abilities, and are ready to take on any new challenge. 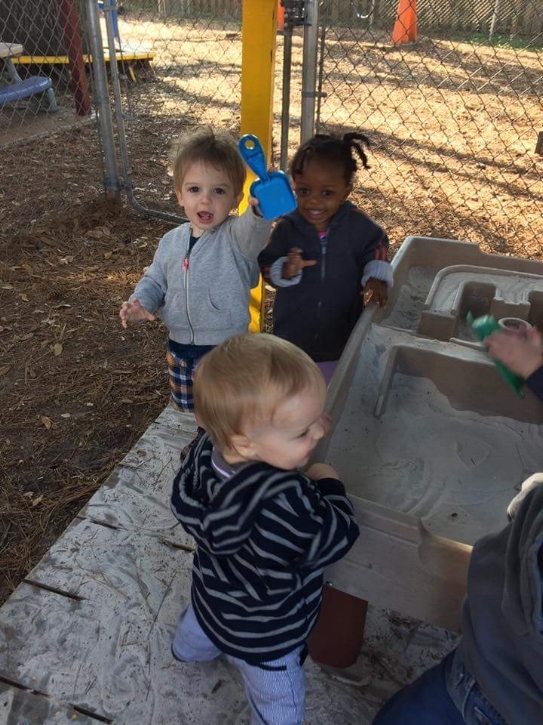 Our preschool program is packed full of hands on learning activities to enhance that confidence. Our teachers develop their lessons to introduce early literacy, history, math and science concepts, while using games, and play to keep the children engaged in their own education. Our preschoolers are more than ready for the transition in to prekindergarten! At this point, children are preparing to enter elementary school, their most exciting journey yet! Our goal for the prekindergarten program is to equip your child with the skills needed to begin school, while easing any anxieties they might have. We use a developmentally appropriate curriculum designed to further each child's literacy, history, math and science knowledge. For example, children will advance from identifying letters and numbers, to forming words, and completing simple math problems!